With AvP's marine campaign sadly cut short due to a somewhat rude evisceration (and I mean impolite rather than poorly made, my viscera was externalised exquisitely) it's time to look to the monsters. Well I said I was saving the best for last. Unfortunately that ranking was based on AvP. 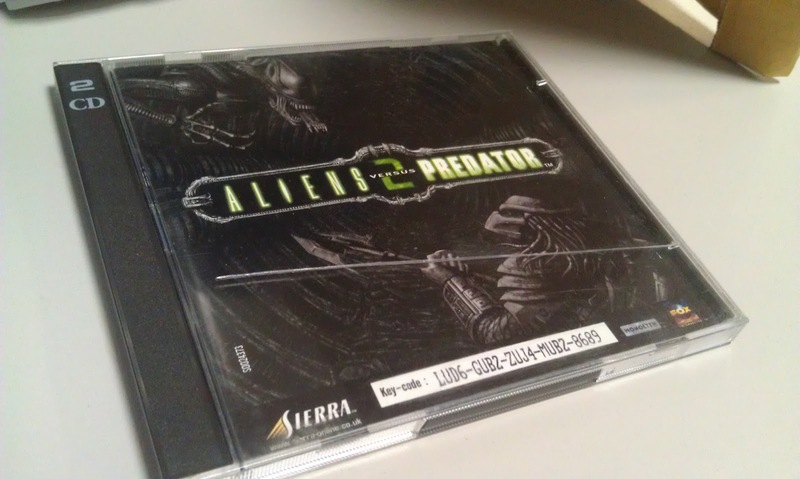 AvP2's Predator campaign is up next and it's ropey. I feel less like a mighty and indomitable hunter and more like an awkwardly hamstrung fatty waddling inevitably towards my death. AvP gives you everything up front saying "Get stuck in lad, tear them up any way you like". My death in that was due to my own stupidity rather than anything else. In AvP2 you're given a spear gun (non-infinite ammo mind you) and your wrist blades. The environment is bland and filled with awkward looking trees with wide, flat topped branches for you to walk on. It looks and feels nothing like you're stalking through the jungle and much more like you're at Go Ape. I take a few heads off, run out of spear ammo and die. The sneaking really is woeful. There's no stealth meter, no feedback from enemies and no cover. It's rubbish and I'm glad it's over. The alien campaign starts with a suspicious, ray shielded, locked, unscannable package being loaded on to a ship. It falls off a table (somehow) and the lid comes right open revealing an egg (no scanning needed then, should have just popped the top). Ok, here we go, it's reign of terror time. Oh no wait I'm playing as a facehugger with no attacks and I have to walk for miles to find a lone target. Not much to say about this playthrough really. I was killed because of the broken wall crawling code which causes you to fall to the ground in front of a flame-thrower wielding guard if you approach a hole in the ceiling. Silly me for expecting to climb up into it like I have for every other corner/grate/vent. So it seems like this blog should be renamed: "The First 5 to 45 Minutes of Loads of Games Followed by a Sudden Death Creating no Tension Whatsoever". I think my problem is that I'm not playing to win. I don't generally unless I'm online against real people. I play for the experience and will happily abandon a game uncompleted and not regret it as long as I've had it's price worth of fun, but that's not really what this project is about. What do you guys think? Should I play with more caution with completion as my goal, or should I experience the game in whatever way I naturally do and damn the consequences? Let me know in the comments. Either way, just like at school, I Must Try Harder. I suspect that playing to win will generate a much more intense (and therefor more pleasurable to read about) experience. Otherwise it feels like you are playing just to get it over with... and that is never fun. But I am having fun! You don't have to complete a game to enjoy it. I'm definitely not playing to lose, but I guess I should remember that the idea is to see if they can be completed with one life, so maybe caution is the way to go. As this is a ridiculously large-scale project I'd advise you to play whichever way you like best - that raises the chances of you actually getting to the letter Z at some point in the far future. I enjoy whatever you write anyways. Thanks for the blog thus far! Thanks Marten! We really appreciate it. And that's a very good point! I agree with Marten, you have a ton of games to go through so you might add well play it how you feel. I find the notes you give on readability situations your faced with a first go 'round very informative. Considering the very small percentages of purple that ever fully finish a game are so low I think you guys give a relatively accurate portrayal of what most pretor go through when they play all of these games. Thanks Geoff! I think I'll probably end up doing a bit if both, as there are some games I feel confident I can get to the end of. I'll no doubt play those more cautiously. I notice you've had some FRAPS issues. I tried it myself for a while and found it a resource hog and essentially gave up on getting good use out of it. But then someone put me onto Bandicam and I've never looked back. It does both screenshots and recording, it can record the output of a process or "anything under a rectangle I define on my screen" and user-friendly (you can define which keys capture screencap/footage, it has predefined settings for 'Youtube-optimised video outputs' etc). Worth a look, IMHO.